Did you know toxins called “obesogens” can disrupt your metabolism? 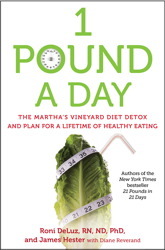 From nicotine to BPA to antibiotics in meat, obesogens increase the number of fat cells you have, decrease the calories you burn, and change the way your body manages hunger, say Roni DeLuz, RN, NJ, PhD and James Hester in 1 Pound a Day: The Martha’s Vineyard Diet Detox and Plan for a Lifetime of Healthy Eating. Here’s how to avoid them. Obesogens enter your body from what you eat and drink, from chemicals and dust in the air that you breathe, and through your skin from the cosmetics and household cleaners you use. You do not live in a bubble. Living in the modern world makes exposure to these toxins inescapable, but you can take steps to reduce your exposure. Every little bit helps. Here are some changes you can make that will protect you and your family. 2. Eat meat and poultry that has been raised without hormones or antibiotics. Grass-fed beef and free-range poultry are good choices. 3. Eat wild fish, not farmed. 4. Reduce your consumption of animal fats, which are high in stored toxins. A high-fat diet can intensify the effects of obesogens. 5. Minimize the amount of processed foods you eat. 7. Limit your consumption of soy products. Despite having high levels of protein, soy promotes fat-cell growth because of its plant-based estrogen properties. 8. Eat fresh or frozen food rather than canned. 9. Use a filter on the faucet in your kitchen and the showerhead, or have a filter installed on the central water line. At the very least, filter your drinking water. 10. Avoid using nonstick pans, especially if they are scratched. 11. Do not use plastic food containers for leftovers. Discard any plastics with a 3 or 7 on the bottom. Glass is best. 12. Ask your grocer to wrap your meat, poultry, and seafood in paper, not plastic. 13. Do not use plastic or Styrofoam cups. 14. Use only BPA-free, ecofriendly water bottles. Stainless-steel or glass bottles are best. 16. Open your windows to ventilate your home. Do not use air fresheners. 17. Replace vinyl shower curtains with cloth. The heat from a shower will cause chemicals to outgas, and you will inhale the gases in the mist. 18. Use an exhaust fan when cooking. 19. Vacuum frequently with a HEPA-filtered vacuum cleaner. 20. Minimize your exposure to thermal paper used for cash register receipts. Make sure to wash your hands after handling receipts.